Date Reminder is a portable tool that reminds you of recurring or nonrecurring events, like birthdays, bills to pay, appointments etc. The program can be run from the Startup folder with an option to show only, if there are any alerts for this day. If Date Reminder is kept in the System Tray (optional), if will also alert you after standby or hybernation. The reminders are listed in chronological order, with recurring events showing only once (the next one). This gives you an instant view of the alerts (at top), as well as a full list of all reminders. Other view modes: Alerts only, History. Given this is a portable tool, no installation is required to use it. Your memory does not always provide a safe method for storing info. When one too many dates need to be taken into consideration applications like Date Reminder give you the possibility to set reminders so that no activity or event is missed or simply be reminded of an upcoming birthday. The application uses a barely noticeable amount of your system's resources so you can rest assured that it runs regardless of your configuration. As far as space is concerned, it takes roughly about 200 Kb so that it fits even in your pocket. All available features, which are not abundant, can be found in a compact user interface. A few customization options let you set background color, along with several font options to cleverly blend in with any desktop it runs on. 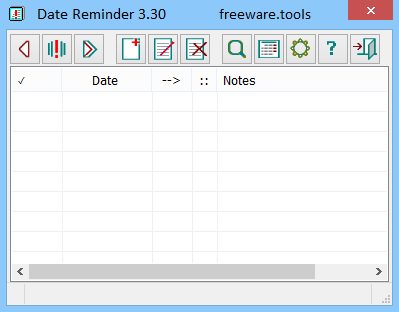 When adding an entry you need only remember the date of the event, as well as a name to be associated with You can create a new reminder either through a function found in an upper toolbar or with the help of a context menu option. Besides the upper toolbar, space is taken up by a list, populated with reminders you set, along with all details you can include. However, features are limited to adding an entry and waiting to be reminded. To sum it up, Date Reminder only shines when it is used to remind you of fixed dates occurring each year. It's easy enough to use, but the overall design and limited features considerably limit it from being used in professional environments.